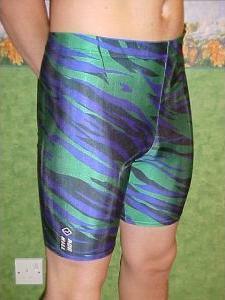 These Ron Hill shorts I won at an eBay auction in 2004. Seller was iboy3, and it was given this description at the auction: You are bidding on a great pair of black, green & purple cycle shorts, with a white logo. Made in England, by Ron Hill from an extremely soft & stretchy 90% polyester & 10% lycra mix, mens size medium waist 32"-35", in a very snug fitting style, with rear center seam for that extra contoured fit. In a very clean wearable condition, with no defects, practically mint, with the exception of the draw cord having been removed. A must for all shorts collectors & retro clothing fanatics.